Yesterday I went to a super cute local coffee shop that had mom vibes for sure as I wrote today’s blog. 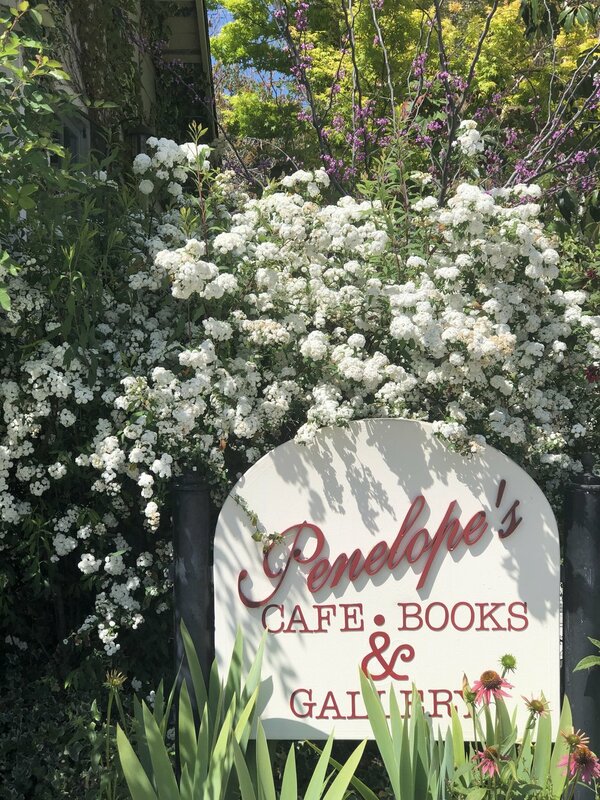 Penelope’s is a bookstore/coffee shop in La Cañada. The entrance features children’s books, cookbooks and wooden tables, and then you get into the coffee shop part in the back. There's also a super cute courtyard with a relaxing water fountain. Why am I sharing this? 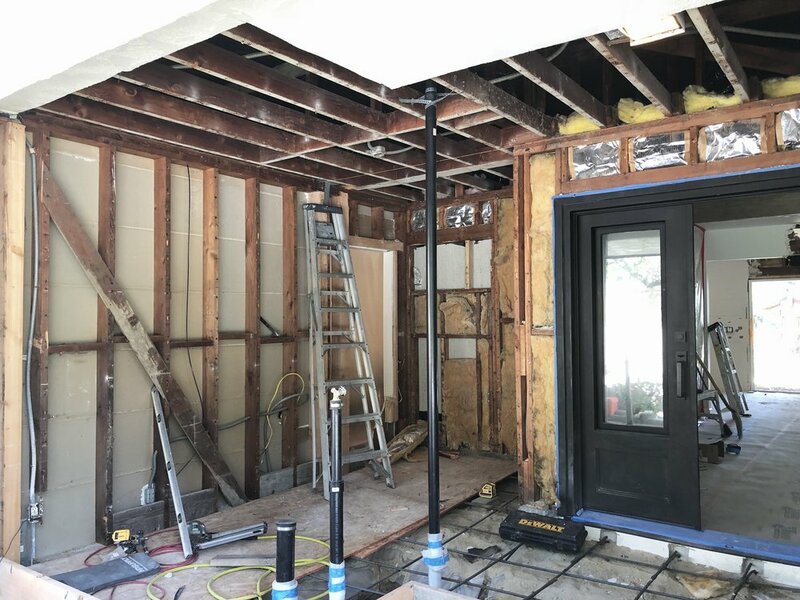 How my home's entryway looks currently. It was actually my second time working there because we’re remodeling a wing of our house, so a lot of it is blocked off for construction and I’m working out of the home at various coffee shops in town for now. I like getting out anyway and having a change of scenery, especially with everything else that is going on in my life right now, from Happy Mom Conference to preparing for our little one to come in May. These little coffee shops are my sanctuaries for now, and I look to find beauty and peace in them. So, self-care. What is it? It means so many different things for different people. It can be as little as what I’m doing this morning, just taking some quiet time before jumping into emails. It can be as simple as enjoying a cup of tea and a scone in peace, without any work or interruptions or babies yelling in the background. As I mentioned in a previous newsletter, I’m still working on this. Although I advocate a lot for self-care, I don’t make a lot of time for it, which I’m working on. I think the moms who have it down practice small, daily rituals, which is a place I want to get back to. I used to be able to make some time for meditation in the morning, but now it’s the chaos of just trying to get the kids out of the construction zone that is our home right now, and everything feels so rushed in the morning just to get some breakfast, clothes, faces washed, teeth brushed, and out the door to school! But I really want to work on finding my quiet moments before the day begins. I want to take some time to talk about a recent self-care trip that I took for our Baby Moon and my birthday, because getting away is a great way to self-care. We went to the beautiful Ritz-Carlton in Rancho Mirage, which we went to before with the kids, but this time it was just us and another couple. We had such a great time, it was so nice to be able to just disconnect from everything (although I did take my laptop and was definitely working on Happy Mom Conference stuff). Just to be away with Art and have that time sans kiddos, although we missed them so much, was so nice to be able to reconnect that way—to have dinners with other adults and enjoy each other’s company again. And the desert is one of my happy places. I’ll never say no to an escape there. There’s something about it that’s just so calming and peaceful. I love just being by the pool and relaxing in the day like that and then enjoying the serenity of desert nights. I also booked myself a prenatal massage on the trip, which was really nice and much needed. I’ve been having major pain in my tailbone area probably from injuring it in my last (back) labor, so that really helped! A sneak peek at my maternity shoot with Guy Galstyan. When you know a potentially stressful moment or season is coming, it’s important to incorporate some self-care at some point to help you handle it better. For me, this means preparing for my upcoming labor and setting up my support. I’ve shared some of my fear about laboring a third time. Yesterday I met with Rachel Adler of Doula Works for some emotional self-care and labor prep. I can’t wait to share more about my experience working with Rachel and her business with you in an upcoming blog! When baby boy’s here I will go on a little bit of a hiatus for maternity leave, which I guess I can call a little bit of self-care time. Although I will be with my newborn, I do cherish that time that I’ll get to have with him. I’m fortunate that the older boys are now both in preschool so I can just spend what I call the “fourth trimester” with my new baby. I really am blessed to be able to do that! I look forward to being with the baby and just creating this peaceful environment for him when the older boys are at school…until they come home and are ready to probably terrorize their little brother! As I mentioned in last week’s Meet the Speakers blog, Liz Arch is one of the amazing mamas joining the Self Care Rituals panel at Happy Mom Conference. Liz is a certified yoga instructor and the founder of Primal Yoga®, and she’s an author! A big part of self-care is knowing how to take care of yourself physically and mentally. To help you along on your self-care journey, Liz is partnering with us to give away her book, The Courage to Rise: Using Movement, Mindfulness, and Healing Foods to Triumph Over Trauma, to two of you happy mamas! To enter, go to @landofmom on Instagram and follow the directions in the giveaway post! Good luck, mamas! See Liz & Other Amazing Mamas at HMC! We have such an amazing lineup for Happy Mom Conference this year. It really will be the ultimate mama self-care experience! My hope is that Happy Mom Conference will be your safe haven to work on personal and professional growth by taking a break from the kids and focusing on yourself. You deserve a break and, if you're in the LA area, this conference is the perfect self-care getaway for you! Start your day with some technology-free meditation before you get into the activity of your day. Try to find some time to step away and enjoy a small treat like I did with my scone. Whatever it is for you, maybe an ice cream or a dessert or cookie. Just step away from the chaos of the kids to be able to just have those few moments for yourself. My routine evening shower is a big self-care ritual for me. I like to get clean and refreshed before I sleep. A morning shower might be better for some people if it wakes them up before bed, but for me it’s just so relaxing and calming, especially when I’m pregnant. I wish I had time for a bath every night, but a hot shower is fine for me. Taking care of your physical body is such an important part of self-care! Staying hydrated, eating right, and going for a walk or taking time for a little exercise are some quick and easy self-care ideas. Ask for help. I know this can be hard as mamas because we just want to take care of everything, but having support so you can get the rest and self-care you need is so important! Ask your spouse or a relative to take your kiddos for a bit while you go to the gym, hang with your girlfriends, or even just sit down with a good book. Mama, any tips on how you make time for self care in your day?